In various ways in different parts of [British Columbia], Native life came to be lived in, around, and well beyond these reserves, but wherever one went, if one were a Native person, the reserves bore on what one could and could not do. They were fixed geographical points of reference, surrounded by clusters of permissions and inhibitions that affected most Native opportunities and movements. Once put in place, they had a long life. Only now, more than a hundred years after most of them were laid out, are they perhaps breaking down somewhat. 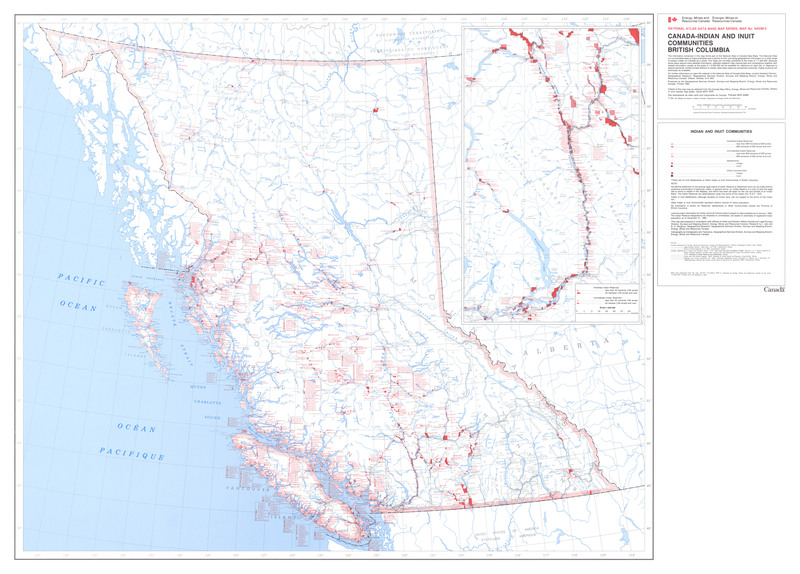 Map of Indian reserves in British Columbia, courtesy of Natural Resources Canada. Click to view the map in full. Reserves are held by Her Majesty for the use and benefit of the respective bands for which they were set apart, and subject to this Act and to the terms of any treaty or surrender, the Governor in Council may determine whether any purpose for which lands in a reserve are used or are to be used is for the use and benefit of the band. The Indian Act further sets out the degree of control and authority that the Minister of Indian Affairs has over the use of reserve lands. For example, the Indian Act states that “No Indian is lawfully in possession of land in a reserve,” and that the Minister must approve any certificates of possession or similar forms of property ownership for on-reserve band members. The Indian Act further states that “the Minister may, in his discretion, withhold his approval and may authorize the Indian to occupy the land temporarily and may prescribe the conditions as to use and settlement that are to be fulfilled by the Indian before the Minister approves of the allotment.” You can read the Indian Act and its regulations over reserves online here: http://laws-lois.justice.gc.ca/eng/acts/i-5/. Precursors to the modern reserve system existed in Canada prior to Confederation and the Indian Act as products of the colonial drive to “civilize” Aboriginal peoples by introducing them to agriculture, Christianity and a sedentary way of life based on private property. As early as 1637, French missionaries had been entrusted by their church with lands to be set aside for their Indian charges. At Sillery in New France (now part of the Canadian province of Quebec), these settlements were created with the intention to encourage Aboriginal peoples to adopt Christianity.1 These first experiments would become a rough model for subsequent reserves in Canada. Colonial agents frequently insisted that a prime motive for establishing the reserve system was to encourage Aboriginal peoples to adopt agriculture. Yet many Aboriginal peoples found themselves displaced to lands generally unsuitable for agriculture, such as rocky areas with poor soil quality or steep slopes. Meanwhile, settlers were quickly securing the most fertile lands for themselves. (Ironically, years later, government agents would use First Nations’ minimal agricultural production—further hindered by discriminatory legislation that outlawed selling produce or livestock produced on the reserve—to justify reducing reserve lands even further.) By the time government authorities began to create reserves in British Columbia in the 1850s, it became apparent that the underlying motive for setting aside small tracts of land for Aboriginal peoples was to make available to newcomers the vast expanses of land outside reserve borders. A reserve is not to be confused with a First Nation’s traditional territory. Although reserve borders were imposed on First Nations, many First Nations have continued hunting, gathering, and fishing in off-reserve locations that they have used for many generations. In addition, important ceremonial sites may be located outside a reserve but continue to be significant for a band’s cultural and spiritual practices. When a First Nation describes its traditional territory, it is describing this larger land base that it has occupied and utilized for many generations, before reserve borders were imposed and drawn on maps. When a First Nation expresses concern about impacts to its traditional territory, its members are likely referring to the far reaching consequences for the nation’s socio-economic, spiritual, and cultural health. When issues of Aboriginal title are discussed, this generally refers to the use and enjoyment of traditional territories. The reserve system undermined Aboriginal peoples’ relationship to their traditional territories but did not destroy it. As noted above, for many First Nations, off-reserve locations continue to serve as sites of economic, cultural and spiritual practices. The relationship to traditional territory also remains significant for many First Nations who have lost access to it, even if they are unable to continue such practices in those locations. The creation of reserves had far-reaching implications for all aspects of Aboriginal life. The reserve system was, on a fundamental level, a government-sanctioned displacement of First Nations. At the stroke of a pen, reserves divided up not only lands but peoples and Nations that had existed for hundreds if not thousands of years. Families, houses and clans that had hunted and gathered together for generations were abruptly and arbitrarily joined up with other families and houses, disrupting social networks and long-established kinship systems that determined who could hunt, fish, and gather in particular areas. As a part of the Crown’s responsibilities for its new Indian wards, government officials sponsored the construction of housing on reserve. These houses were designed with the Western nuclear family unit in mind, and could not accommodate larger, more extensive Aboriginal families. Often shoddily built on a small government budget, housing became yet another foreign and divisive experience imposed by reserves. Initially, Aboriginal people were able to adapt to this government-imposed restructuring of their homelands and lifestyles. In 19th century British Columbia, for example, many Aboriginal women and men were employed in seasonal labour such as hop picking and cannery work. This allowed them to continue their seasonal ways of life, and to continue their hunting, gathering, and seasonal celebrations. At the start of the 20th century, however, First Nations peoples in British Columbia began to be marginalized from the capitalist workforce. This was partially due to growing competition from new immigrants (some of them willing to perform cheap labour) and to open racism in the hiring process.6 In addition, by the 1950s, advances in technology led to the mechanization of labour and further centralization of industry in urban centres far from reserve sites. Jobs such as hop picking simply disappeared. Disruption of traditional networks, marginalization from the capitalist economy, as well as discriminatory legislation that outlawed resource distribution and severely limited Aboriginal people’s ability to fish and hunt, led to a rapid increase in poverty on reserves. Many Aboriginal people living on reserves suddenly found that they were unable to sustain themselves or their families. However, leaving the reserve meant facing discrimination and assimilation in urban centres, relinquishing one’s Indian rights, and losing or jeopardizing connections to family and territory. This situation intensified into the mid-20th century as Aboriginal peoples, legally wards of the state, found few alternatives to accepting the minimal support offered by the federal government. This, along with discriminatory legislation and assimilationist programs such as the residential schools and the “Sixties Scoop,” has contributed to the situation that many reserves find themselves in today. The reasons for these socio-economic conditions on so many reserves across Canada are complex and the subject of ongoing dialogue and debate. However, it is widely accepted that the cultural genocide and social disruption perpetrated over generations through displacement, discriminatory legislation such as the Indian Act, and federal programs such as the residential school system created enduring hardships among Aboriginal peoples and hindered the re-establishment of social networks and the development of stable communities. In addition to these social hardships, reserve communities often face economic and environmental challenges. Reserves are typically located in areas where economic opportunities are limited, and the reserves themselves provide few resources. Access to resources such as fish and timber are heavily regulated, and in many cases the government maintains ownership of any mineral or subsurface resources. (In British Columbia, this is addressed in the BC Indian Reserves Mineral Resources Act.) Because reserves are held in trust by the Crown, people living on them do not “own” the land. Property is not considered an asset, and band members generally face difficulty in obtaining mortgages, small business loans, or lines of credit. They also face more restrictions than private owners when it comes to developing their land. As well, government rights-of-way such as power transmission lines, railways and highways frequently intersect reserve lands, dividing them up and further reducing useable space. The impacts of the reserve system also take on a gendered dimension. Aboriginal women on reserves face additional challenges with property, for example. Historically a woman has had to leave the reserve community she married into if her husband abandons her or passes away. 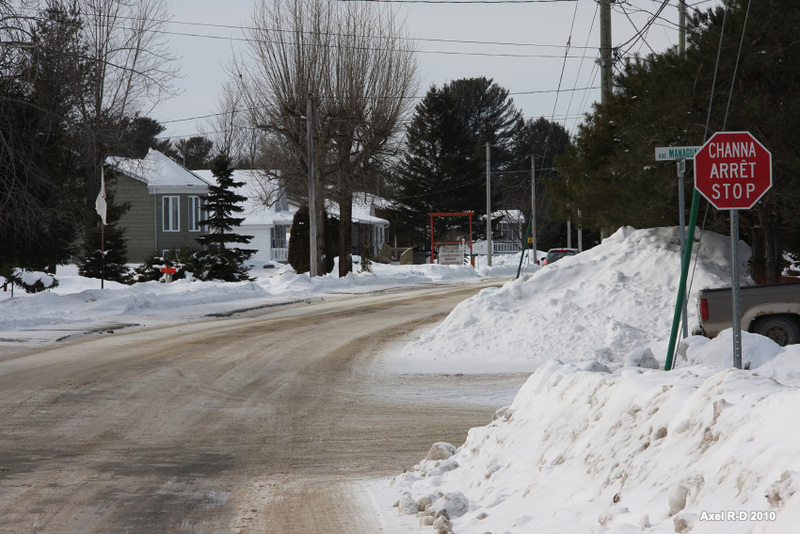 In these cases, lack of regulation regarding on-reserve matrimonial property has forced many women to leave their homes and belongings behind as they leave the reserve. (See, for example, the Native Women’s Association of Canada’s page and resources on matrimonial real property, available at http://www.nwac.ca/policy-areas/nation-building/matrimonial-real-property/). A reserve can provide a community in which Aboriginal people feel free to practice their cultures and customs, live close to their extended families, and raise their children in their cultural and ancestral homelands. This reserve environment can allow band members to promote cultural values and teachings and sustain the culture’s vitality. Reserves are, therefore, a disruptive and in many ways destructive imposition that, through the strength of the peoples who occupy them, often simultaneously support cultural survival. While the above exchange took place in 1969, these debates continue today. Some continue to argue that reserves should be converted into fee simple, or privately-owned, lands. Those who do not agree with this approach point out that this proposal, frequently made by non-Aboriginal Canadians, is based on Western conceptions of private property, and operate on the assumption that the only “solution” to the challenges reserve communities in Canada face is to assimilate into non-Aboriginal “white” society and adopt non-Aboriginal lifestyles. Many leaders and activists maintain that they can work towards overcoming the challenges of the reserve system and simultaneously retain their Aboriginal ways of life. Further, to simply abolish the reserve system absolves the Canadian government of its legally-binding obligations and commitments it made to First Nations. As with the Indian Act and related policies, the reserve system is highly problematic. However, reserves also represent First Nations’ unique relationship with the Canadian state and highlight the state’s obligations to Aboriginal peoples—and, perhaps, its lack of commitment to them. Bartlett, Richard H. Indian Reserves and Aboriginal Lands in Canada: A Homeland. Saskatoon: University of Saskatchewan, Native Law Centre, 1990. Frideres, James S., and René R. Gadacz. “Profile of Aboriginal People I: Population and Health.” Chap. 3 in Aboriginal Peoples in Canada, 56–92. 8th ed. Toronto: Pearson Prentice Hall, 2008. Harris, Cole. Making Native Space: Colonialism, Resistance, and Reserves in British Columbia. Vancouver: UBC Press, 2002. A fantastic resource about reserves and the cut-off lands in B.C., including the testimonies of those affected first-hand by the McKenna-McBride Commission, maps, photographs, and other archival documents. 1 Royal Commission on Aboriginal Peoples, “The Imposition of a Colonial Relationship,” in Report of the Royal Commission on Aboriginal Peoples, vol. 1, Looking Forward, Looking Back (Ottawa: The Commission, 1996). 3 Keith Thor Carlson, “Indian Reservations,” in A Stó:lō Coast Salish Historical Atlas, (Vancouver: Douglas & McIntyre), 2001, 94. 4 Cole Harris, Making Native Space: Colonialism, Resistance, and Reserves in British Columbia, (Vancouver: UBC Press, 2002), 291. 6 Keith Thor Carlson, You Are Asked to Witness: The Stó:lo in Canada’s Pacific Coast History, (Chilliwack: Stó:lō Heritage Trust, 1997), 120–1. 8 Christie Blatchford, “Blatchford’s Take: Shame and Disgrace—Canada’s native reserves deserve foreign correspondent treatment,” The Globe and Mail, February 2, 2008. Available online via http://groups.yahoo.com/group/protecting_knowledge/message/17389. Accessed May 2010. 9 Office of the Auditor General of Canada, “Land Management and Protection on Reserves,” 2009 Fall Report of the Auditor, sec. 6.59. Available online via http://www.oag-bvg.gc.ca/internet/English/parl_oag_200911_06_e_33207.html. Accessed May 2010. 11 Canada, Indian and Northern Affairs.Statement of the Government of Canada on Indian Policy. Ottawa: Department of Indian and Northern Affairs, 1969. Available online via http://epe.lac-bac.gc.ca/100/200/301/inac-ainc/indian_policy-e/cp1969_e.pdf Accessed February 2011. 12 Indian Association of Alberta. Citizens Plus. (“The Red Paper.”) Edmonton: Indian Association of Alberta, 1970.